Exciting new technology is emerging out of Japan that would give seniors the ability to be mobile essentially whenever they please, with greater ease than ever. Hitachi has developed a robotic self-driving car that is able to navigate autonomously through the help of lasers, GPS, and cameras. This self-driving car would give those who cannot drive or navigate as easily as they would like the freedom to do so in a safe and useful manner. 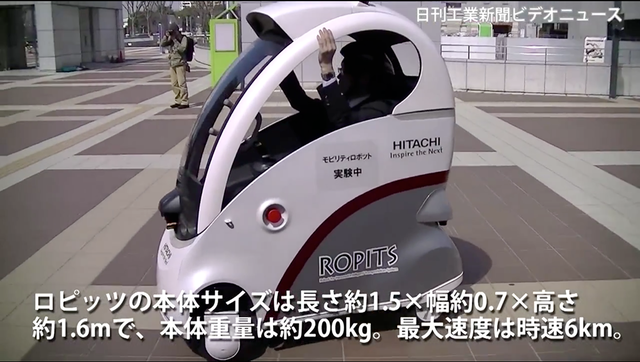 Named, ROPITS (Robot for Personal Intelligent Transportation System), this self-driving car has been deemed a “mobility support robot” by Hitachi and is designed for a single passenger. The product works very simply: those wishing to use its services request the vehicle to pick them up through a portable station with reservation capabilities. The ROPITS then uses its highly-efficient GPS system to find and pick up the passenger requesting a ride. The passenger then can input the location of where they wish to be taken and the car will navigate its way there. The designers of the ROPITS prototype envision its possibilities to include navigating streets, sidewalks, and even buildings. This would give users greater access and mobility within their surroundings.